Keep hands covered and protected with the TAC AK2 Gloves from 5.11 Tactical. When working in dangerous environments where normal gloves just will not do, a pair of TAC AK2 offers the enhanced protection needed to get the job done. 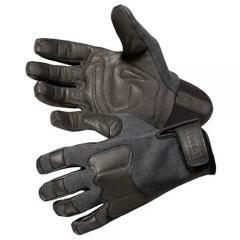 Featuring a rugged American made Kevlar construction, the gloves deflect sharp objects and guard against flash burns. Premium goatskin palms add to the functionality of the gloves by providing excellent griping strength on wet and dry surfaces. Tactical Touch precision finger tips preserve dexterity, allowing users to work controls, type and handle weapons comfortably. The palms and knuckles are padded for added safety and comfort.